It’s Fall, y’all! Time to get our Halloween on! How To Host a Haunted Mansion Party and How To Host a Disney Villains Party. Hopefully, they’ll help you get in the mood for the year’s spookiest holiday. Also, be sure to check out our list of our Favorite Haunted Mansion Goodies, the Best Disney Halloween Costumes and of course, our Ten Favorite Disney Halloween Items! To help you fund some of these awesome Disney items we’ve found, we’re giving away a $50 Disney Gift Card! Want an extra extra EXTRA entry? Follow Mickey Fix on Pinterest and then come back here on this post and leave a separate comment letting us know you did so! The giveaway will end on October 9th, 2017 at 11:59pm. The prize will be provided by Mickey Fix. We will confirm that you are a subscriber of the Mickey Fix newsletter. Mickey Fix is not affiliated with the Walt Disney Company or its subsidiaries. United States only. I’m already signed up! Love Mickeyfix! Signed up with Facebook and Twitter as well! Liked your Facebook page as well! I signed up! 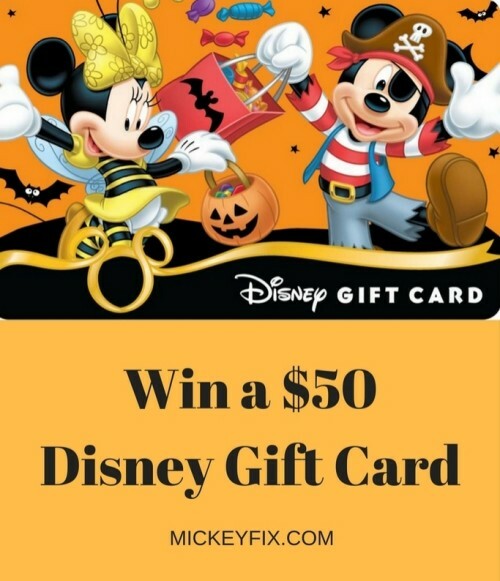 My husband and I are going to WDW in November so the gift card would be great!! I signed up, love to win it would help with our trip in Jan. I also like the Facebook page. Already subscribed, visited page, followed on Twitter and Pinterest. Visited Mickey Fix on Facebook and liked it! Visit Mickey Fix on Facebook and follow! I visited and liked your facebook page, I also signed up for your newsletter. I have signed up for the newsletter!!!!! I have been to, and am following you on Facebook!! I am following you on Pinterest!!!!! I am already signed up. Following you on Pinterest – thanks for the opportunity to win! Hi! I am a newsletter subscriber! I visited the Facebook page. I’m signed up……let the mickey fix begin! I am also a follower on Pinterest! Checked Pinterest and I’m already following! Visited (and like/follow) on Facebook! Subscribed and now following on Facebook ???????????? Following and have been subscribed for some time now. Signed up!! Thanks for doing this! Went back and visited the FB too for he extra entry! Signed up, liked and followed on o8ntreat don’t have a Twitter. Disney trip is under a year away for us!! I am subscribed and following on Pinterest. following on twitter, F.B. and Pinterest. Love these giveaways!!! You are so fun to follow on twitter!!! Now I’m following on Pinterest. Thank you! I visited your Facebook page! I already follow it as well! Already a Mickey Fix subscriber! Facebook liked and shared, but already a follower! How could I not be, especially when you want to help me decorate! Retweeted on Twitter … follower already! Visited and following fb page! Signed up for mailing list! likes, Subscribed already…this is a legit contest! I love my Mickey Fix! I am already a subscriber. Signed up. Would love to win! I am following you on Pinterest now as well, thanks for the tip! Already a subscriber. Thanks! Fingers crossed. ???? I am already signed up for the newsletter. Thank you for the giveaway chance. Visited Mickey fix on fb. I visited mickeyfix on Facebook. I love all of your special deal offers on all things Disney. Just visited and liked facebook page! I’m a mickey fix subscriber!! Subscribed. Can’t wait to get emails. Subscribed to the newsletter and hope to win a gift card! Visited the Facebook page and gave it a ‘like’! On the email list already. Signed up! Going to Disney world in 3 weeks! I visited and liked you on Facebook! Visited Mickey Fix on Facebook ???? already a subscriber, already follow on facebook and already follow on pintrest. Thanks! I’ve liked the Mickey Fix page on Facebook. I’m now following Mickey Fix on Pinterest! Signed up! Thanks for the contest! Yay! I love Mickey Fix! I subscribed to your website and can’t wait to get my newsletters! ???????????? Followed Mickey Fix on Pinterest! Visited and liked Mickey Fix on Facebook! We’re going to Disneyland in October for the first time during the Halloween celebration I can’t wait!!! Signed up! We take our trip on November, can’t wait! Liked and following on Facebook! Subscribed to newsletter and followed on Pinterest. Already a FB fan and following on Twitter. Subscriber to this wonderful newsletter! Visited and followed on pinterest! I visited, liked and am following your Facebook page. Signed up for newsletter! Thanks! I subscribed to your newsletter. Thank you!!! Already signed up for your email newsletter! Signed up for the newsletter ???? Already a faceback fan and visit the page daily! Visited Micky Fix on Facebook! Visited and followed Micky Fix on Twitter! I’m going in 43 days! And staying at CBR! It’s done!! I’m excited for this contest! This is for the initial post! Following Mickey Fix on Twitter! Following Mickey Fix on Pinterest! Following Mickwy Fix on Twitter. Liked and following on Facebook too! Having been signed up on the newsletter for some time, here is my comment. Keep up the good work! The $50 gift card would come in very handy for our visit next month. Visited Mickey Fix and followed on Facebook. signed up for email, paged liked..Thanks for all the info all the time. I love this site! Just signed up to enter the gift card giveaway! Already get the emails! ???? I am a subcriber to the Mickey Fix newsletter. Subscribed and following on facebook! I subscribed, visited Facebook and followed on Twitter and Pinterest. Went to the website too! Already a subscriber! Liking it! Already subscribe. I’d love this gift card for my vacation. Visited Mickey Fix on Facebook. It’s where I saw the giveaway. I visited Facebook and follow your page. And I follow on pinterest! Already subscribed, loked and commented. Best site ever!! already subscribed and following on Pinterest and facebook. love Halloween so much i got married on Halloween. Already a subscriber. Good luck everyone. Already subscribed, already follow on Facebook, already follow in twitter, and just followed on Pinterest! Already subscribed to newsletter and already subscribed on Facebook! And now following on Pinterest! I am now a subscriber and I visited on Facebook! Thanks for the opportunity Mickey Fix! I love Disney! Need to purchase more Disney items. Already a newsletter and twitter follower! Already signed up for newsletter! Treat my nieces to bibbidi bobbidi boutique next year on their first Ever Disney trip!! Visited and following you on Facebook. Already a Mickey Fix Newsletter Subscriber!! Went over to Pinterest and am now following Mickey Fix there too! Already a subscriber and follow Mickey Fix everywhere I LOVE MICKEY FIX!!! I would love a $50 gift card! Signed up for newsletter. Following on Twitter and Facebook! Planning our Disney vacation and this would really help! I love getting the newsletter and have liked your Facebook page. Already subscribed! Pick me!! Thanks! What better reward than a Disney Gift Card ????. I am a current newsletter subscriber! Already subscribed and love it! I follow Mickey Fix everywhere I can and know that it has steered me in the direction of some great Disney items. I am an FB fix follower!! I follow Mickey Fix on Twitter! I have been following you on Pinterest for a long time. In fact – that is how I found you at all! I recently visited your Facebook page. Done and done! Good luck everyone! ???? I’m already subscribed and love your site!! I liked yalls Facebook page! I follow y’all on Pinterest! I follow y’all on Twitter! I’m signed up! I love the site and have used it a lot! I’ve been a subscriber! love your news letter! Love the great Disney information that you get from the Mickey Fix! Just went to your FaceBook page! Love it! I am already on the subscription list. Love it. I’ve been a Mickey Fix subscriber for a while now … and I love it!! I get the Mickeyfix emails! ???? Signed up with the new email address! Love the Facebook photo! Still following! You have lots of followers on Pinterest! Still following on Pinterest? Continuing to follow you on Twitter! I subscribed, checked out and liked on Facebook and followed on Pinterest! I visited Mickey Fix on FB! All set!!! Ready to get my Mickey on!! Subscribed to Mickey Fix ! Entered and following all social platforms! Fingers crossed! Signed up for the email and already follow you on twitter and Facebook!! Liked you guys on FB. Found and followed on pinterest too. Already subscribed to mickeys newletter!! I always visit mickey fix on facebook!! And I’m following on Facebook. Good Luck, everyone!! !